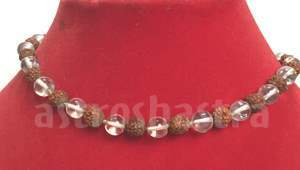 Energised Malas 12 - This Mala is made up of 55 Rudraksh beads and 54 natural round crystal beads, constituting 108+1 beads mala. Crystal beads balances & harmonise the aura around us and remove the negative energy, therefore when we wear this crystal beads , our body is purified by the power of crystal. 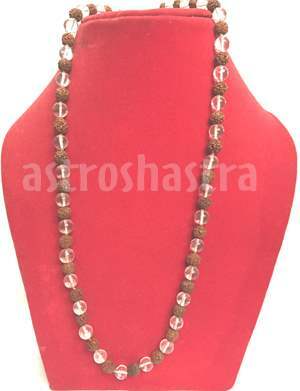 It is evident and proved that crystals replace all negative energies with unlimited abundance and positive power, whereas rudraksh in the mala helps in attaining success in all walks of life and gain knowledge, wealth, power, fame and achieve goals. 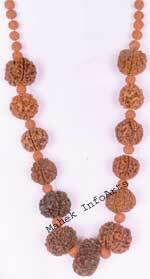 The Five Mukhi Rudraksha is useful in regulating the body’s fat and blood pressure. 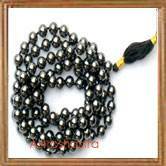 It brings charm and well being in life of the wearer and makes the mind peaceful . The people who face problem of memory loss may wear it to remove the problem. Accidental death gets avoided by wearing it. 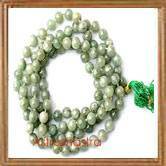 People who want good health, spirituality and peace shall wear this rosary. Wearing this also improves relation with coworkers, relatives and friends. It helps in enhancing one’s self esteem. The Five Mukhi Rudraksha removes all stress and offers complete peace of mind. It is very helpful to patients of stomach ailments and other patients of diseases like mental disability, blood pressure, obesity, stress, diabetics, anger management, piles, neurotic, maladjustment problems and heart problems. 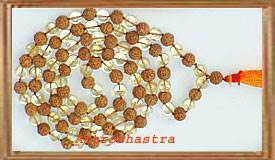 How to wear Rudraksh and Crystal Mala ?